“Avengers: Infinity War” builds to perhaps the most lyrical denouement in comic book movie annals. We will proceed in delicately in our description, so don’t run away, but suffice to say that the inherent invincibility of the film’s countless superheroes is suddenly compromised. You don’t know precisely what is happening as it does, only that it is momentous, underscored by how the blustery Alan Silvestri score mostly falls away, intrinsically zeroing you in on the characters and their fate. The pragmatic particulars of that fate matter less than the images, enigmatically imagining the keepers of Marvel’s bank account as nothing more than, in the words of Steve Walsh, dust in the wind. In my original “Avengers” review, I compared the smattering of superheroes to a band, though back then these Avengers were like The Allman Brothers, big enough to require a pair of lead guitarists but not excessive. Now they’re like Bruce Springsteen’s pre-E Street Band, the ill-fated Dr. Zoom and the Sonic Boom, which surrounded its ample musicians onstage with copious people just doing random stuff, like a dude playing Monopoly. “Avengers: Infinity War” has so many characters that Black Panther, King of freaking Wakanda, is basically reduced to the dude playing Monopoly. Characters often exist less as characters than callbacks to other movies, delivery devices for audience applause. That’s why we get a Stan Lee cameo, a la “Black Panther”, a self-referential tear in the hermetic seal that works against the sober culmination. All these characters are required to oppose Thanos (voiced by Josh Brolin), oversized, ogre-ish, who once ruled Titan, but in opting for murder to prevent overpopulation found himself on the wrong side of intergalactic ethics. All this, I think, happened in some other Marvel-sanctioned movie, as it is not organically part of the narrative here but glimpsed in clipped flashbacks. No, the integral part is his attempts to acquire all five infinity stones, rocks precious for explicated reasons that Thanos attaches to some sort of sci-fi contraption on his fist that will essentially render him invincible. As such, he must be stopped. In charting these arduous efforts to stop him, “Infinity War” mines fine individual moments, as most of these superhero movies, whether good or bad, do. Joe and Anthony Russo’s script (they also directed) is funny, if not as often as the Joss Whedon-penned versions, with a few too many one liners that are less delightfully satirical than disappointingly conventional, like a late moment where Scarlett Johannson’s Black Widow, seeing something unpleasant, mutters “gross.” Still, an intertitle that simply says “Space” is classic, and the chemistry between Robert Downey Jr. (as Tony Stark, from a Marvel movie I have seen) and Chris Pratt (as Star-Lord, from a Marvel movie I have not seen), emitting notes of a hipster Newman & Redford, demands follow-up. We don’t get much of it, though, because we don’t get much of anything, whether it is that, or Tony Stark’s atypical mentorship to Peter Parker (Tom Holland) or Thanos’s relationship to Gamora (Zoe Saldana), originally from Titan, for whom he deeply cares even if she does not for him. Josh Brolin is best in show, playing Thanos as a fanatic wholly committed to his cause but also contemplative, two dueling notions that come through in his deep voice. And Brolin’s own expressions, transposed onto the CGI creation he gives life to, match that air perfectly. It’s quite a performance, and the one around which the entire movie orbits. 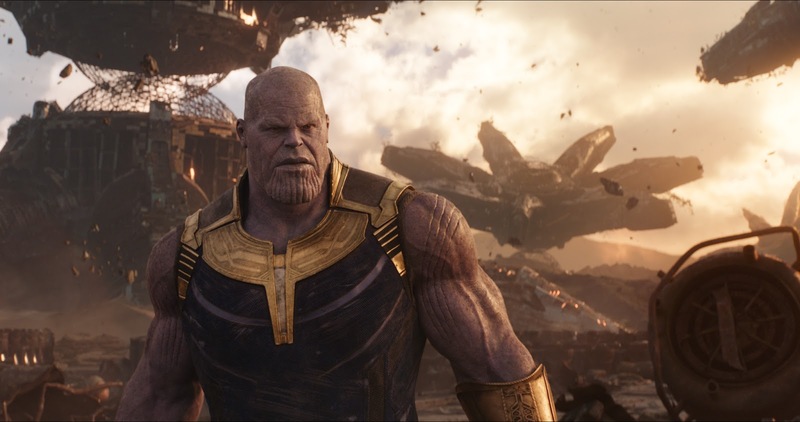 The character is nigh unstoppable, never more than a late film showdown in which the otherwise larger than life good guys are made to seem so small as they one-by-one come up empty-handed in trying to slay Thanos, rendered in slow motion illustrating how easy everything comes to an infinity stone-juiced villain. But it is a sequence carrying, frankly, more weight than the usual gargantuan ones, where so much CGI is hurled on the screen amidst whirling cameras that do not allow us to see much of anything, sound and fury signifying, etc. The latter is all the more disappointing because they are mere retreads of an eternal truth – that is, the immortality of our superheroes. 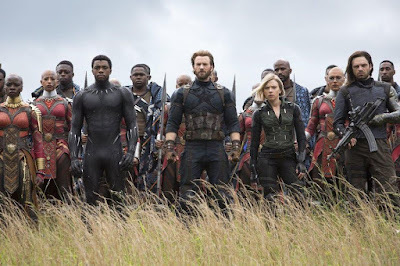 It is this truth that “Infinity War” seeks to muddy by forcing its innumerable characters to confront the idea that Thanos cannot be defeated, and that they, icons, might have to sacrifice themselves to save the universe, an idea pushing back against the emotional aloofness that inadvertently cropped up in the preceding “Age of Ultron.” It is an interesting notion the end is meant to embody. But then, the end is not really the end; it can’t be the end. 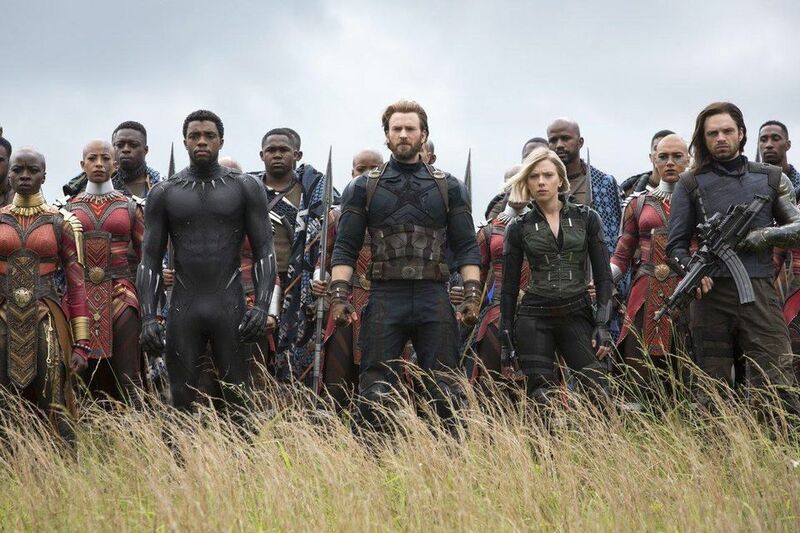 After all, “Avengers 4” is slated for 2019. And that this is already known counteracts the character frailty “Infinity War” yearns to make its whole point, not so much sacrificing any of its characters so much as sacrificing a true artistic statement, merely teasing impermanence in the name of continuing the brand.